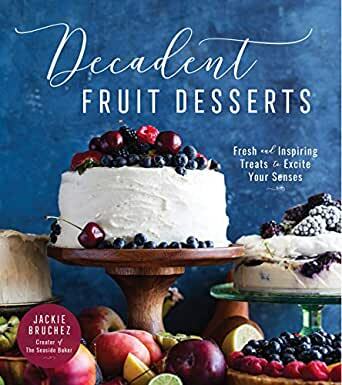 Decadent Fruit Desserts: Fresh and Inspiring Treats to Excite Your Senses - Kindle edition by Jackie Bruchez. Cookbooks, Food & Wine Kindle eBooks @ Amazon.com. Fruit desserts are more than tarts and pies—they’re cakes, mousses, cookies and so much more. It doesn’t matter if you grow and pick from the garden, or browse and buy from the farmers' market or grocery store, Jackie Bruchez has the perfect dessert for your bounty. This comprehensive cookbook helps you pack more sweetness into your day in the most extravagant fashion possible. The variety of flavors makes it easy to spice up simple cookies with berries in Blueberry–White Chocolate Oatmeal cookies, swap out brownies for Apple-Maple Blondies and make the most of summer with a Rhubarb-Striped Mango Cake. Every confection includes fantastic fruits that elevate each dessert to something more complex than the average sweet. I have been following Jackie Bruchez from The Seaside Baker on Instagram for awhile now and when I saw she was coming out with a fruit dessert cookbook, I knew I had to have it! These recipes are not your everyday fruit desserts either, so it was refreshing to look forward to all of the new and fun desserts to try. I have tried a few recipes now and all of the instructions were super clear and easy to follow! With little "Baker's Note" to serve as tips, which is a great additive. For example, a tip provided for one of the recipes is you can make part of the recipe up two days ahead and serve when ready. Great to know for when preparing for a party and can pick that dessert to help save time. I love how versatile the cookbook is, from cakes and pies to ice cream and mousses with every fruit in between! I tried the Blueberry- White Chocolate Oatmeal cookies and they are AMAZING! Everyone is still talking about them. I also loved the Apricot-Oatmeal bars, but I didn't share those!! Don't let the beautiful photos discourage you from trying the recipes, no matter what it will still come out tasting delicious. I love how not only does it have great desserts, but when I am not in the kitchen this book is also a great coffee table book when having guests over. The pictures are fun to look at and sparks conversation. (The pages are easy to wipe down if you are messy like me in the kitchen). You can easily find the recipes from the index. Overall, very happy with the cookbook and results! Too many "fruit dessert" cookbooks attempt to use fruit as a lower calorie alternative to the kind of rich dessert many of us crave or want to serve to guests. Not this one. Decadent Fruit Desserts by Jackie Bruchez stays true to its title. The recipes range from the simple and easy-to-prepare to show-stoppers. Every recipe is accompanied by a full-page color photograph of the finished product to help guide you on what to bake and how it should look when you're done. And yes, the clear instructions make sure that your own results will look like, or at least close to, those photos. All recipes are a single page, and some take up only a partial one. The two recipes I tried -- Raspberry Frangipane Scones and No-Bake Mini Cheesecakes -- had clear and easy-to-follow recipes. The scone dough wasn't as moist as the recipe stated it would be, although it's entirely possible I made a mistake since I was recovering from jet lag when I made it. Regardless, the scones were delicious. The No-Bake Mini Cheesecakes recipe with its mixed berry additions to the filling and top worked exactly as it should have. The little jelly jars filled with graham cracker crust and gelatin-based cheesecake are especially great to have on hand for afterschool snacks and informal dinners and picnics. Only about half, maybe less, of the recipes appeal to me, hence the removal of a single star; however, half of 60+ recipes is still substantial. After all, I generally return to cookbooks for my favorite five, branching out only when I want to prepare something new. Not all of the desserts in the book are beautiful, but the ones I've tried are full of flavor. At a little over 150 pages, it's not a huge book, and that makes it a no-brainer to put it on a shelf among the other cookbooks I return to regularly. 4.0 out of 5 starsFruit is good for you, right? Fruit is good for you, right? Well, not always, not when you add sugar and butter and cream and all sorts of decadent, wonderful things. The first thing I tried was the "Merlot-Poached Pears" because I already had the ingredients on hand. Well, except for the vanilla bean; I had to make do with extract. They were delicious anyway, and not hard or complicated to make. Next, because I have lots of lemons right now, the delicious but traditional "Mile-High Lemon Meringue Pie." There are several fig recipes, and I can't wait until my figs come into season so I can try them. Do be aware that some of the ingredients and tools are not in everyone's kitchen, I, for one, do not have a food torch, needed for the brulee tart. Some of the recipes are pretty simple, some require some time and dedication to tackle. However, the directions are clear, as are the ingredient lists. I haven't found any discrepancies yet. The photographs are gorgeous, each dish shown, but don't expect yours to look quite as nice unless you are a food stylist, and I am most definitely not. This is a beautiful book if you just want to browse, but also very practical when you want something a little fancier than that scoop of lemon sorbet. The book includes 60 fruit recipes but the title is Decadent Fruit Desserts so don’t expect healthy low fat recipes. Many of the inclusions are indulgent with significant amounts of butter and heavy cream. I am impressed with that the book is filled with unique creations and a wide range of fruits. Some may be a bit difficult to find dependent upon the part of the country. Many of the recipes are good choices for special occasions and holidays—events where something decadent is somewhat expected. Some recipes span two pages and are reasonably complicated with numerous steps and a long list of ingredients but a good number are brief and for all the instructions are clear so there is something here for all skill levels from novice to expert. Not surprisingly, fresh fruit is used in the dishes and obviously some choices require seasonal fruit subject to availability. There are fig recipes and that fruit is pretty rare around here, along with kumquats. The Lemon Cheesecake bars that I prepared were delicious and I do look forward to making some of the cherry recipes but it is too early in this part of the country to see them in local markets. The book is a sturdy paperback with a stay-open binding. There is a color photo for each recipe and a good cross-referenced index in the back of the book which makes locating recipes by, for example a desired fruit, quick and easy. I like the book and am sure it will be handy when I am looking for something different and delicious to do with fruit.